How to import Calendars/Events from other messaging clients? Where <your domain name> is the domain name portion of your email address after the "@" symbol. For example, if your email address is "john@example.com", then "example.com" in this case, is <your domain name>. In addition, make sure you check the "Standard" Webmail interface option instead of the default "Basic". This will give you a full AJAX based Webmail Interface, enabling Drag & Drop, Smart Tip-Tool, and many other interactive user interface elements. Whereas, the "Basic" option provides compatibility with almost all browsers, but without any of the AJAX functionalitiy! Please log into your WebMail interface now before proceeding with the following instructions. Please note that ONLY iCal (.ics) formatted Calendars are supported at this time. The iCal format is generally supported by majority of modern Messaging platforms. For specific instructions on exporting Calendar/Events as iCal Calendar from your existing messaging platform, please refer to the help documentation included with that platform. To import iCal Calendars/Events into your Calendar, follow these steps. 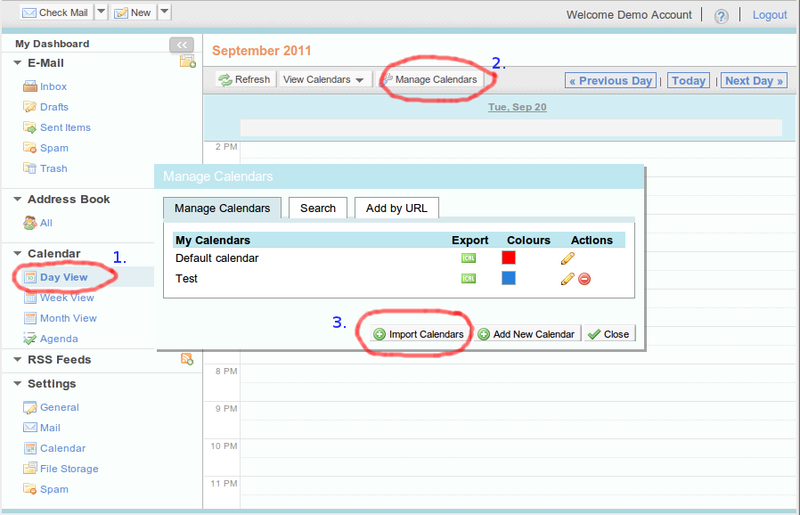 Select any one of the four Calendar views in the left-pane of the Webmail interface. Click “Choose File” button as shown in Fig. 2 below to locate the exported iCal file from your other messaging clients. If you have multiple existing Calendars, then click the Calendar chooser drop-down list to select which existing Calendar you want to import into as shown in Fig. 2. Click “Import” button to complete the import process. Repeat Step 2 to 6 to import other additional exported iCal Calendars from other messaging clients.